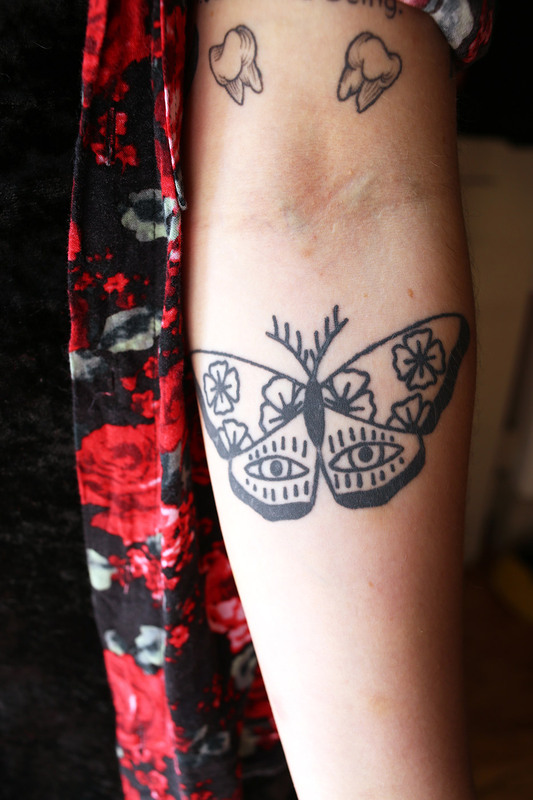 When did you first start thinking about getting tattoos? Lois: I knew I wanted to get one before I even knew what they really were. I’ve been drawing possible tattoo designs since I was eight years old. When I was 17, my friend hand-poked two little symbols on the back of my ankles using a sewing needle attached to a pencil. It was a spur of the moment decision. After that I became addicted. Carey, can you tell me a bit about your tattoo journey? 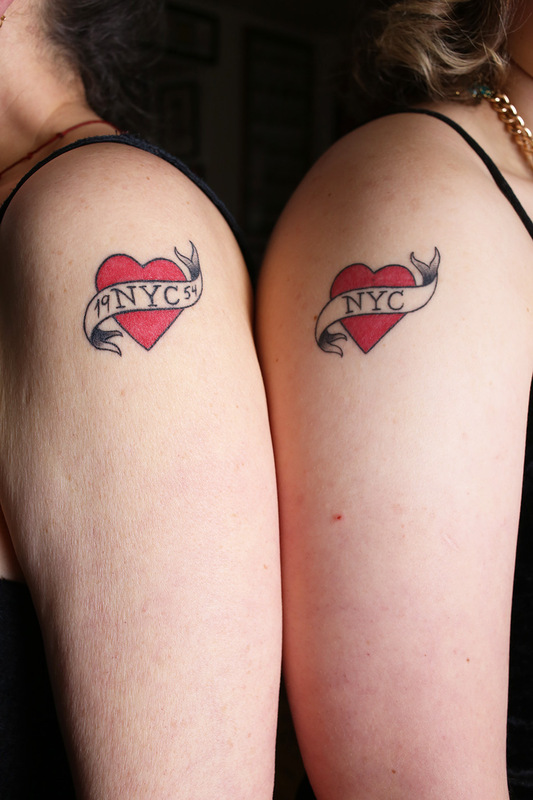 You wanted to get a tattoo from a young age, but got your first tattoo in your 50s? Carey: I was born in the mid 50s and grew up with Life and National Geographic magazines, which exposed me to tribal cultures around the world. My brother and I would tease my mother on long car journeys by discussing what tattoos we would get. She was horrified because she couldn't bare the thought of our bodies so altered, which is how many parents feel. As a teenager in the late 1960s, I began a life-long habit of embroidering, altering, adorning and making my own garments. Hand-worked embellishment is a major driving force in my daily life. Decorating the skin became a natural next step. 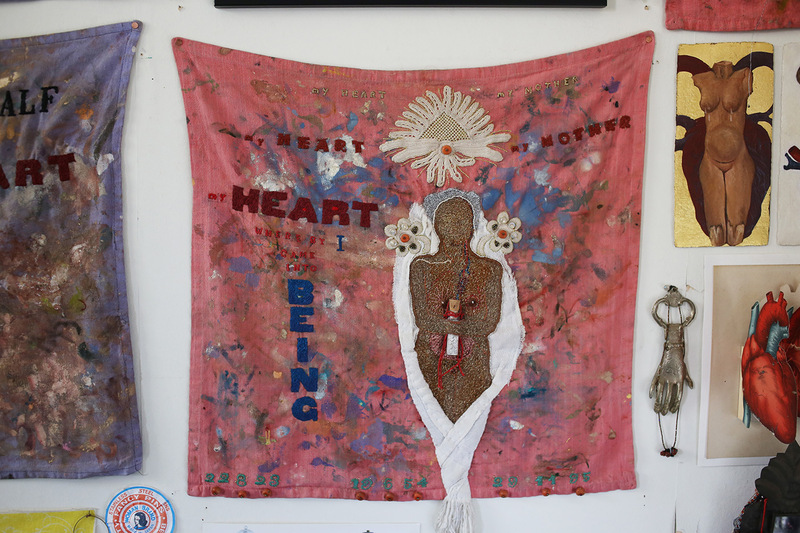 Carey’s artwork features a quote from the Egyptian Book of the Dead: “My heart, my mother, my heart, my mother, my heart where by I came into being”. 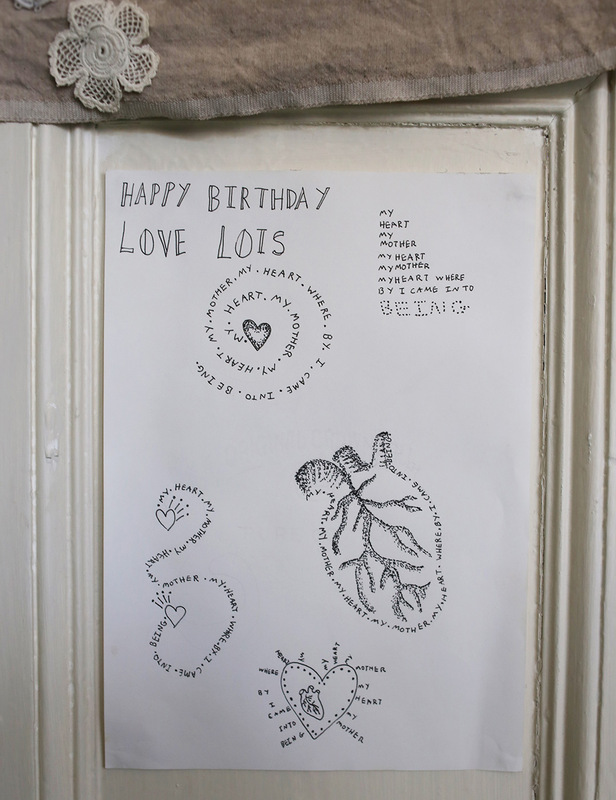 Lois included these lines in her first tattoo when she turned 18. Tattoos make us more visible to the world. How have you both experienced this in your everyday lives? 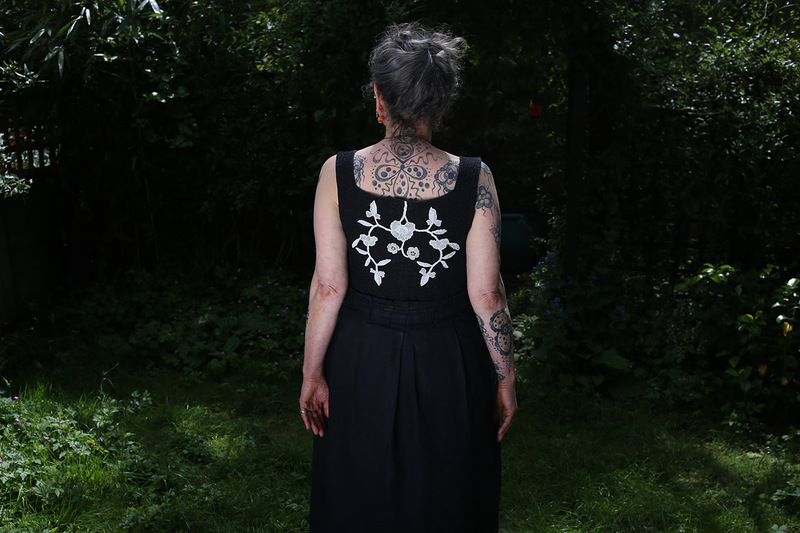 Lois: I think it’s very easy to get sucked into the tattoo and modification world and forget that a lot of people aren’t used to seeing heavily tattooed people. I definitely realised this when I moved to the suburbs of Bristol from London. I would be looked at differently because of my tattoos. 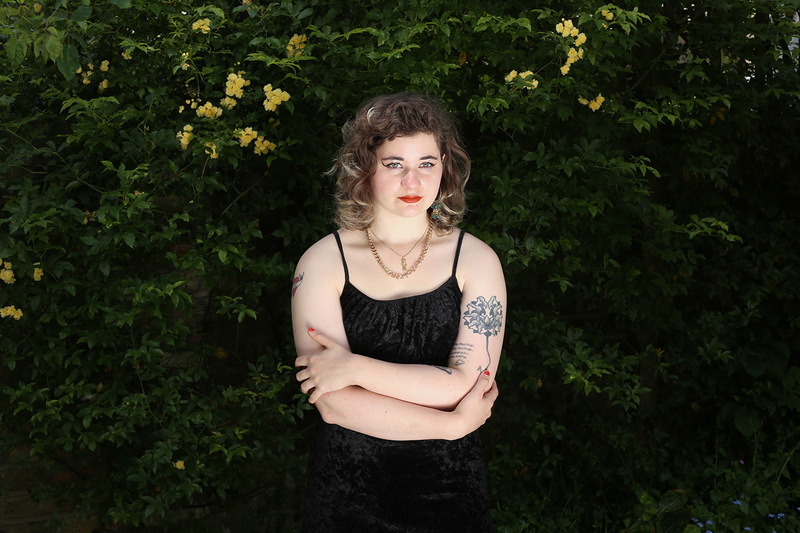 I think a lot of people weren’t used to seeing a young woman with untraditional tattoos. I used to get really embarrassed when people commented on my tattoos, but as I’ve become older and more confident in my skin, it doesn’t bother me anymore because I know that I’m happy with my tattoos - and that’s all that matters. Carey: In our western culture older women are often assumed to be and made to feel invisible. We live in an ageist society where elders are disregarded, even though there are so many of us living well into very old age. Tattoos make me very visible. They invite comment and start conversations with people of all ages. They are barrier breakers. Very similar to having a dog they allow people to approach. As I’m often engaged in conversations about them, my experience on a daily, public level is that I am seen and therefore not invisible. Occasionally, I have had disturbing reactions, but being older and confident in my choices, I have no trouble dealing with it head on. For the most part I take delight in these interchanges, especially in a city like London where people try very hard not to acknowledge anyone. 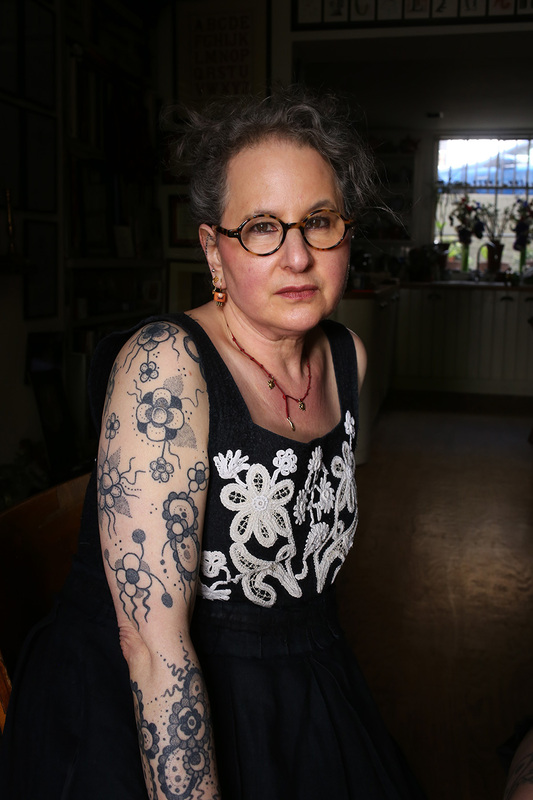 There are benefits to being old when you start having tattoos: people feel uneasy critiquing your choice, you are past the age where you can be scolded and by the time your skin is aged and wrinkled you are close to death anyway! 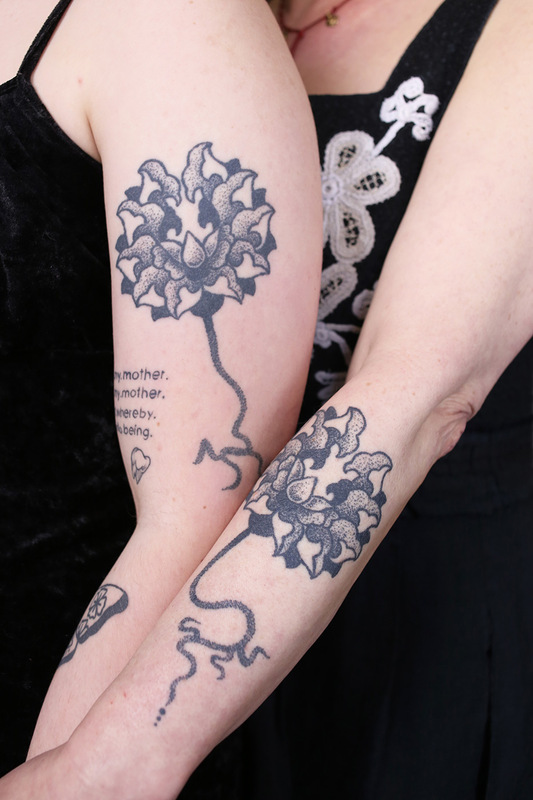 Carey, you've made me realise that tattoos can help us embrace and accept the fact that our bodies are ageing and changing. 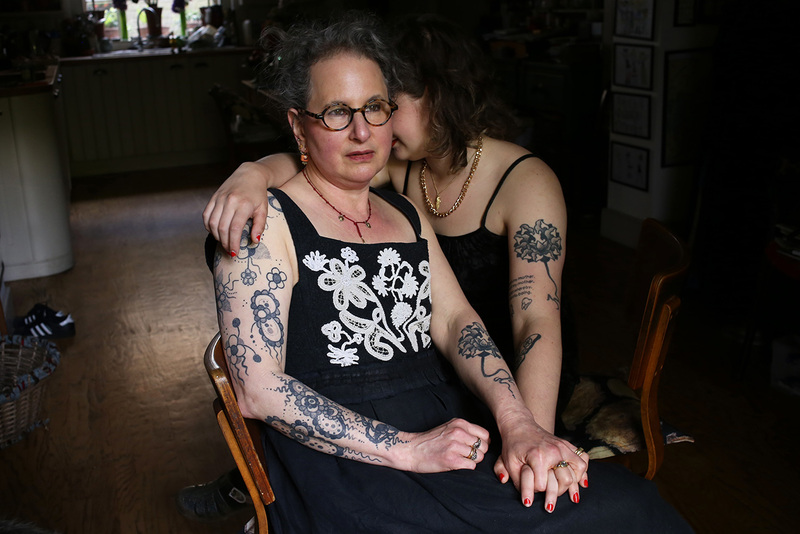 I wondered how you both felt about this aspect of tattoos? 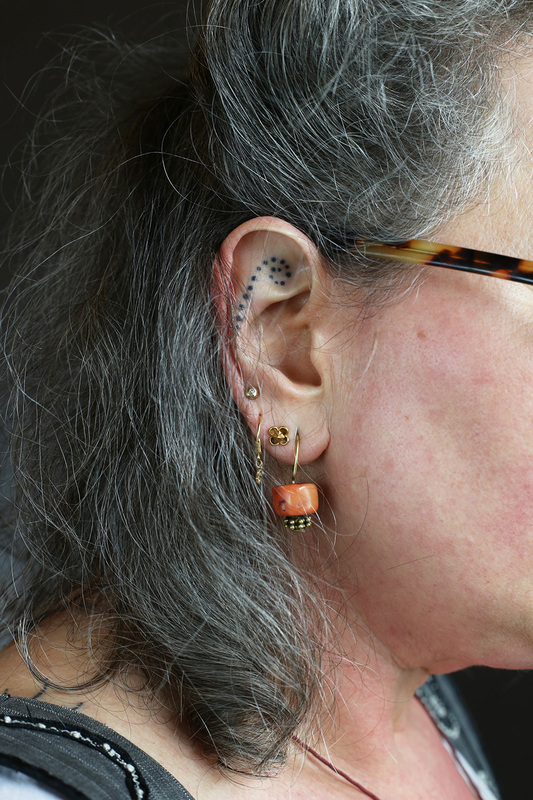 Carey: Having my first tattoo at 59, my body had already changed a great deal. Life continuously leaves marks and scars and this was not a problem for me. That said, I was surprised how altered my feelings about my body were once there was art on it. I stand taller, I am conscious of how I move, I oil my arms and I dress to enhance the tattoos. I feel more attuned to my physical form. I love this body for the art on it. At 62 this a gift. I am richly decorated for this phase of my life and I look forward to continuing the designs and watching them age with me. They mark the start of my 7th decade in a joyous way. 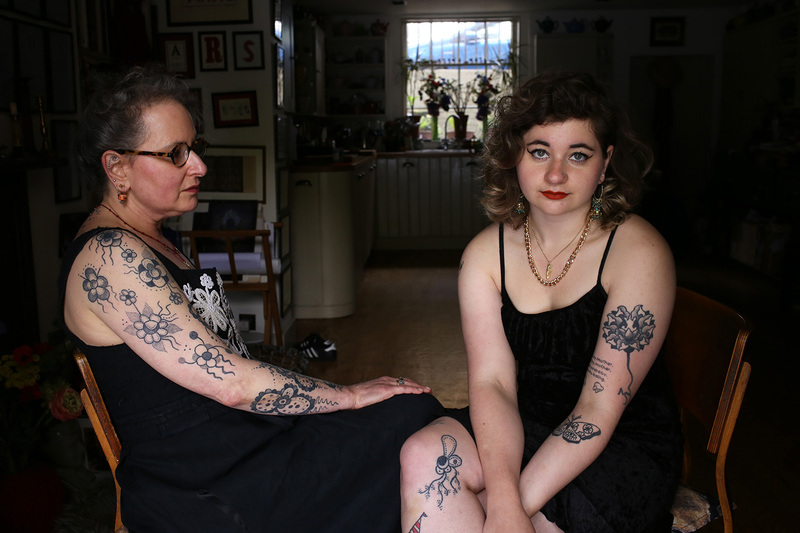 Lois: I’ve been told by a lot of people that my decision to get tattoos when I was 18 was a mistake because they will age “badly” and look “ugly” by the time I’m 50. To me, tattoos are not about looking young and beautiful, it’s about being comfortable in your skin. I can’t wait to get older and see my tattoos age and change throughout my lifetime. Carey: Lois was initially worried about reactions, both from teachers (as she was still in school) and family. That’s why I purposely placed my tattoos in a prominent position. I figured that when we were together no one would critique her in front of me. As it happened, a circus trainer told her that she made a mistake and ridiculed her in front of other people - and he wasn't even her teacher! I immediately complained to the head of the programme and he was reprimanded. It is far too easy for young women to be humiliated, and adults who should know better do it without thinking, assuming that a young person has no sense and makes misguided choices with no thought to the future. We change continually throughout our lives and while we may change our views, the marks we accumulate are the maps of our individual journey. Everyone has the right to make their chosen mistakes, to go down unknown paths and find their own way. My job is to protect my children, not to tell them what to do. 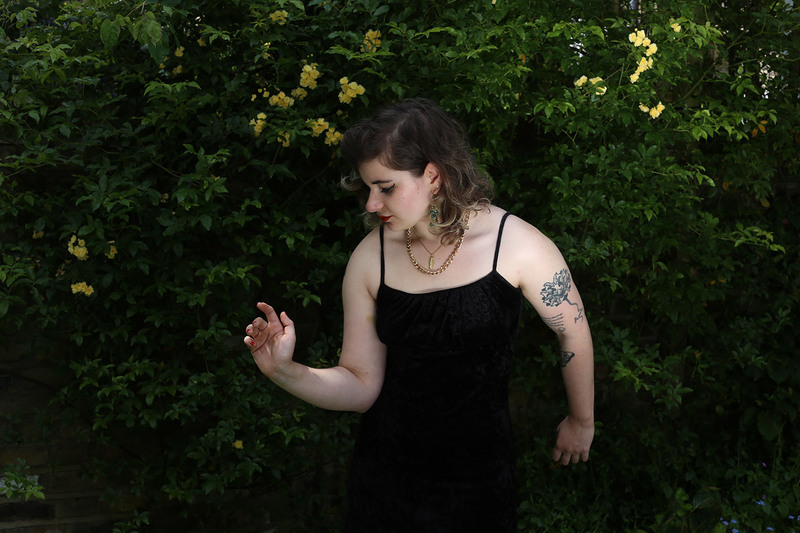 Lois, as someone who is training to become a performer, do tattoos play a role in forming your visual identity as an artist? 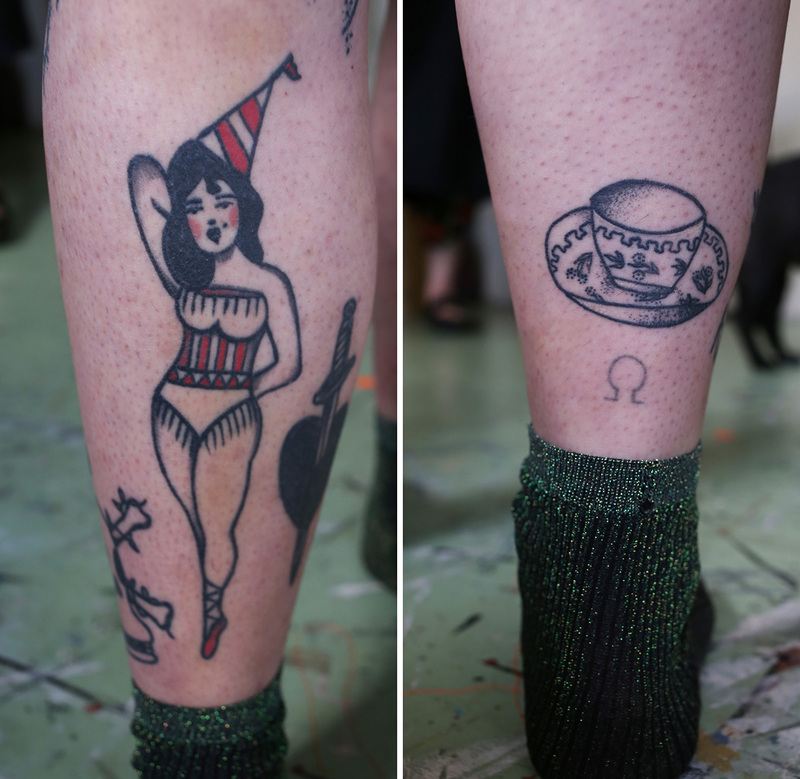 Lois: Most of my tattoos can be covered very easily so if I have to for a performance it isn’t a huge deal. When I perform I like to show my tattoos because, not only are they a part of my body, they are also part of my personality. Before I got tattoos I was worried about how it would affect me as a performer, until I saw NoFit State’s circus performance Bianco in 2012. The finale was a beautiful trapeze piece high in the air. I didn’t realise until the trapeze artist came lower to the ground that she was covered in traditional Japanese tattoos all over her arms and legs. She looked so confident, strong and happy. Those are the things I want to show when I perform. Some mothers and daughters go out shopping, we go out to tattoo conventions. It's beautiful how close a relationship you have with each other. Have tattoos brought you even closer? Carey: Lois and I have always had a close attachment. Getting tattoos together is just another experience we share. I have been enthralled by tattoos for decades as an art form, but her request moved me to actually have that first tattoo. I will always remember this as something we did together. 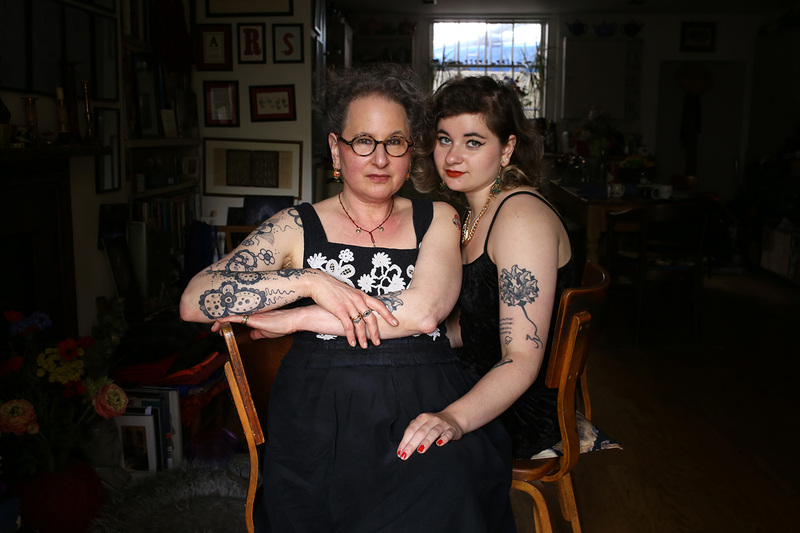 Lois: Getting tattoos and becoming more involved in the tattoo world has brought us closer, but I think we would be just as close if we were not interested in tattooing. Some mothers and daughters go out shopping, we go out to tattoo conventions.